As a child of the 80's, it wasn't unusual for my sister and I to go trick or treating by ourselves. Flash forward 20 years, and those days of unsupervised trick-or-treating has long since passed. If your family is one of the many who goes trick-or-treating, there are some things you should consider doing to remain safe throughout the night. Even if you’re just planning on going around your neighborhood, it’s very helpful to plan your route in advance. You should also tell a friend or family member who is not going with you, what your planned route is. This will be helpful if there are any emergencies along the way. It’s always a great idea to go as a group, even if you’re not planning on being out at night. Children should never go alone and you should always have enough adults to handle the number of small children you’re bringing. It’s easy for someone to run off or run out into the street. And speaking from experience, it can be a heart-attack inducing moment. It’s also important to wear lights or reflective gear and clothing when you’re out late. Even if it’s not completely dark yet, you could be hard for motorists to see. One of the thrills of Halloween is getting to stay out late, and the candy of course, but being outside late at night also makes it difficult for drivers to see you. Keep your kiddos safe by making sure they all have flashlights or glowsticks. Toss a few glowsticks in their candy bucket, to make sure they keep up with them, Because after all, what kids is going to go anywhere without their candy? This can be especially difficult if you have sneaky kids (like Little J) that like to pocket candy before the inspection. Are there any Halloween or trick-or-treating safety tips that you and your family practice on Halloween night? Sound off in the comment section below. We already do all these! Yay! These are such important reminders! It's terrible that a few wacko people create the need to be so careful but safety is everything! Thank you so much! These are such great tips! You can never be too careful! Great tips! I'm glad to say we are doing all of them! Although, it's my husband who tries to sneak the candy along the way - the kids know to wait, lol. These are great tips! Our neighborhood is so active on Halloween it is a lot of fun. But it is still so important to have everyone stay safe. I agree with the glow sticks, kids just think they are fun and parents know they help with visibility. Great tips! Thanks for sharing these. 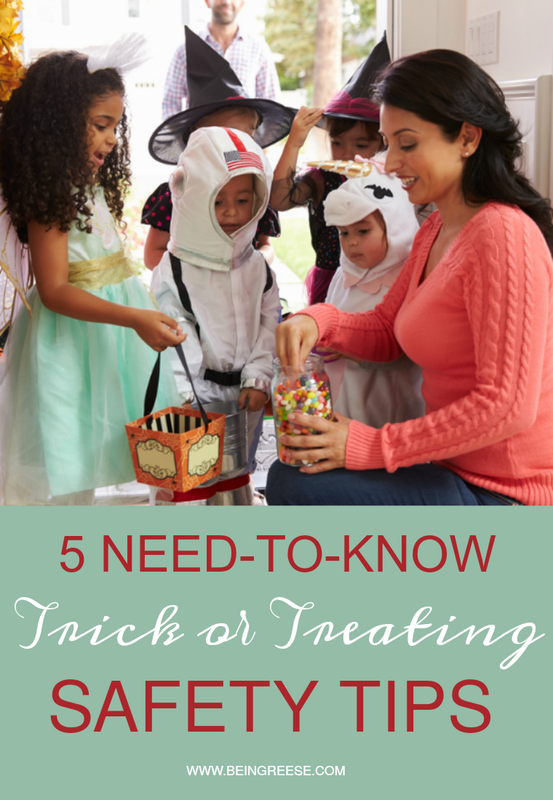 We were just talking about trick or treating this year, so this is very timely. Thanks! Love the tips! My oldest is 18 and he checks his own candy now lol ..yup he does go trick treating LOL... He takes his siblings will get candy too since he'll ask me to put zombie makeup on his Ha.. Checking the candy was drilled into me as a child, and I've always carried that on. The reflective clothing is vital too. Great tips. Trick or treating has changed so much since I was a kid. What a great a post and so important these days to be careful! These are all really good tips to know!